When people around the world celebrate International Workers‘ Day on Friday, supporters of the Aboriginal communities facing closure in Australia will hold solidarity marches across the globe. May 1, which is a public holiday across Europe and in many other parts of the world, is traditionally a day for promoting the advancement of labour rights, but is increasingly being expanded to include other human rights concerns. Berlin, Los Angeles and London are among the cities that will see Aboriginal solidarity marches on Friday, with events planned across Australia and New Zealand as well. Supporters will be marching in protest of the proposed closure of more than 150 Aboriginal communities in Western Australia, after Prime Minister Tony Abbott said taxpayers should not have to subsidise the Aboriginal „lifestyle choice“. The announcement was first made in November and the debate has remained heated ever since. 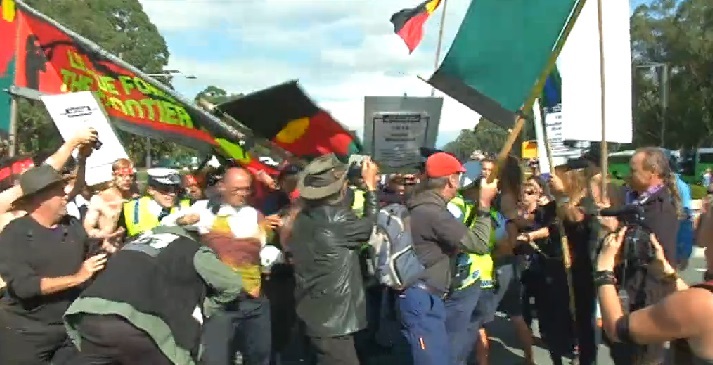 On Saturday the Australian Federal Police attempted to seize footage of a solidarity march in Canberra which clashed with police. The footage was shot by the publicly-funded indigenous broadcast network NITV during Anzac day, another national holiday in Australia.